After going perilously close to being relegated last season, Wolfsburg are planning for a brighter future under head coach Andries Jonker going into the 2017/18 campaign. 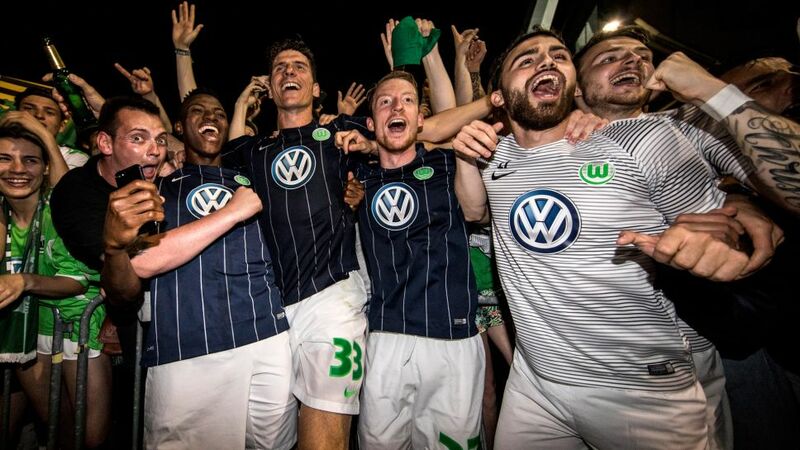 Runners-up in the Bundesliga two seasons ago, Wolfsburg needed to come through a relegation play-off against Eintracht Braunschweig to secure their top-flight status for another year. Having dropped to third from bottom after conceding a late winner against Hamburg on the final day of the season, the Wolves showed more bite in the local derbies against Braunschweig by winning both legs 1-0. “On the whole, I am very, very relieved and happy,” Wolves boss Andries Jonker said after watching his side make the most of their last chance to avoid the drop. Mario Gomez, who scored the winner in the first game, was more forthright in his appraisal. Watch: See a sixty-second recap of Mario Gomez's stellar season for Wolfsburg. Wolfsburg are planning to do without a similar end of season battle next time out. Having done just enough to extend their 20-year stay in the Bundesliga, the 2009 German champions and 2015 DFB Cup winners have been swift to rebuild ahead of the new term. Perhaps the key signing Wolfsburg made is a player who was already at the club. Gomez scored 16 goals in 33 Bundesliga matches last season – almost half of his team's total of 34. That made him the fifth-top scorer in the German top flight in 2016/2017 and Jonker will be further relieved to be able to rely on the 31-year-old again. “In spite of having had a very difficult season, I have every faith in our team, the club and the fans,” Gomez said after agreeing to stay on at the club in June. Daniel Didavi – with four league goals – was the next highest scorer for Wolfsburg last season and Wolves Sporting Director Olaf Rebbe was keen to offer Gomez more support in attack. Enter Landry Dimata, who joined the club in June after a spectacular first season in the Belgian Pro League. Having grown tired of waiting for his chance to shine at Standard Liege, he had backed himself to enjoy a breakthrough year at KV Oostende. The powerful Belgian Under-21 forward did just that, scoring 12 league goals to help his new club qualify for Europe for the first time in their history and netting twice in the defeat to Zulte Waregem in the Belgian Cup final. Still only 19 and already drawing comparisons with compatriots Romelu Lukaku and Christian Benteke, Dimata will be determined to prove that he has what it takes to step up another level next season. To strengthen a defence that shipped 52 goals last time out, Wolfsburg moved for Hertha Berlin centre back John Anthony Brooks. The 24-year-old USMNT international admitted that it was a tough decision to leave his home town team but he also said that he liked what he had heard from both Jonker and Rebbe. At right back, Wolfsburg have brought in William from Brazilian club Internacional. The 22-year-old helped his country win gold at last summer’s Olympic Games in Rio, although he did not feature in the final victory over Germany. He can also play on the right side of midfield and is a player who is well aware of Wolfsburg’s former glories. “VfL is a very well-known club in Brazil,” William said. “Many great players, such as Grafite, Josue, Diego and Naldo were successful there. Another new signing is Germany Under-21 international midfielder Marvin Stefaniak, who arrives after lifting Dynamo Dresden to an impressive fifth-place finish on their return to Bundesliga 2. There have, of course, been some significant departures too. Left back Ricardo Rodriguez has moved to AC Milan, while Philipp Wollscheid and Borja Mayoral returned to parent clubs at the end of their loan deals. Swiss goalkeeper and club captain Diego Benaglio – who made more appearances for Wolfsburg in the Bundesliga (259) than any other player – has left for Monaco, although he is set to return to join the staff once his playing career is over. Koen Casteels was the club’s first-choice net-minder for most of the previous campaign, however, and the 25-year-old Belgian was given a contract extension in June. “A season like the last one cannot be allowed to happen again,” the Wolves’ new number one said after penning his latest deal. Everyone connected with the club would no doubt agree. By striking early and often in the transfer market this summer, Wolfsburg are giving themselves every chance of a better outcome next season.